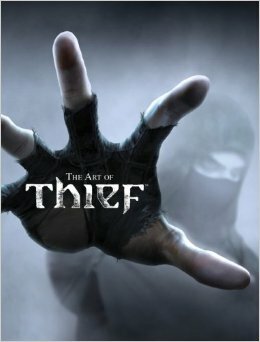 The Art of Thief by Paul Davies is an insightful overview of the design process that went into the new reboot of Thief. What the game lacks in a diverse color palette (it’s black and blue and…that’s it), it makes up in intricate detail and realism (they thought about middle-class furniture vs. upper-class furniture!). The team’s commitment to making every aspect of the game realistic is clear – there are parts where the team talks about figuring out if items would be viable in the real world. They even provide digital fabric swatches for some outfits, and briefly discuss making an actual Garrett costume. I learned from The Art of Thief that Rhianna Pratchett (Tomb Raider) was a writer on the game, something that I didn’t know before. She’s only quoted once, about Garett’s characterization; most of the quotes are from Nicholas Cantin, the game and art director. The 192-page book is divided into four sections: Garrett; The Characters; Loot, Puzzles, and Props; and The City. Every page is glossy and extremely clear, and equal attention is paid to everything. There’s a great map of the city at the very end, which I’m sure will be appreciated by players. Reading the book enforced my desire to play the game (and the rest of the series), and is an excellent addition to the library of any Thief fan. Published by Titan Books. 192 pages. Get the book at Amazon for $18.96. Watch for Pam’s review of Thief soon on Nerdy but Flirty!